Christian involvement in questioning and resisting apartheid in the period between the founding of the Christian Institute of Southern Africa (CI) in 1963 and the banning of organisations and activists opposing apartheid in October 1977 has been focused on in biographies and in academic surveys and analyses, a selection of which forms the frame of reference for the contribution at hand. The movement confessing and acting against apartheid as from the early 1960s, of which the CI had become the most outspoken representative, had emerged and gained momentum not as programmatic and as systematic as one might assume, if one were later to focus only onto the outward initiatives which that movement generated in the seventeen years between the Sharpeville-Massacre  and October 1977 when that movement ultimately fell prey of repressive measures that the apartheid-regime had continually employed to silence and dismantle it. Key words: Christian Institute of Southern Africa (CI), apartheid, Sharpeville-Massacre, English-speaking churches, Christiaan Frederik Beyers Naudé, Nederduitse Gereformeerde Kerk (NGK), World Council of Churches (WCC), Cottesloe-Consultation, Broederbond, Pro-Veritate, uMkhonto weSizwe, Dutch Reformed Churches (DRCs), African Independent [African Initiated Churches] Churches Association (AICA), Black Consciousness Movement (BCM), Steve Biko, South African Council of Churches (SACC), Study Project on Christianity in an Apartheid Society (SPRO-CAS), Enos Sikakane, Interdenominational African Ministers Association in South Africa (IDAMASA), Programme to Combat Racism (PCR), Confessing Church, Kirchenkampf, Schlebusch/Le Grange Commission, Black Theology, Manas Buthelezi, Soweto, Oshadi Phakathi, Hammanskraal Resolution, End Conscription Campaign (ECC), Broeder Kring/Belydende Kring, Belhar Confession. Taking part in initiatives and projects, interacting and exchanging perceptions with contemporaries in the early 1970s, the current author acquired considerable insight into incidents and developments concerning the topic at hand which have been continually updated and reflected upon over a lengthy period and could in the meantime be supplemented through consultation and study of archival records particularly at the Beyers Naudé Centre for Practical Theology in Stellenbosch and at the Alan Paton Centre & Struggle Archives in Pietermaritzburg as well as through participative observation at various venues in South Africa and Germany to date. Measures of repression in South Africa had reached alarming extremes when on 21 March 1960 a police-unit opened fire on demonstrating residents in Sharpeville near Vereeniging, killing 69, injuring hundreds and arresting at least just as many of them. The Sharpeville-Massacre, as that incident soon came to be known, marked a turning-point in the political context of the 1960s and the decades to follow. The civil rights’ movement in present-day South Africa (and Namibia) took shape and gained its profile in the struggle against apartheid – against those teachings and that practice of segregation and subjugation that had become government-policy in post-colonial Southern Africa since 1948 – which endured notably in the period following the Massacre of Sharpeville. The values and convictions underlying the commitment of those who take initiative and bear responsibility for the various ventures within organisations and networks in the civil rights’ movement, very often show close affinity to principles that are usually upheld by persons and societies with as far-reaching ideological affiliations as those of believers in the one or the other religion-tradition – in most cases Christians. The churches in the diversity of their confessional profiles have often been a significant factor in that development in South Africa (and Namibia). As far as the “English-speaking churches” are concerned, it had at the latest shortly after the Sharpeville-Massacre become apparent that not all member-churches of the Christian Council of Southern Africa, the forerunner of the South African Council of Churches (SACC), denounced and were opposed to apartheid: Church-denominations of British as well as those of American, European and Scandinavian origin, the so-called “English-speaking churches”, who had been founded and continued to be led and controlled only by whites, would, like the Roman Catholic Church, as beneficiaries of the government-policy of segregation and oppression at best always give lip-service to questioning apartheid or would rather even dare to condone the one or the other measure in favour of maintaining the status quo ; they, however, seldom would go as far as the white Dutch Reformed Churches (DRCs) to openly seek to justify that system. The pursuit of questioning, challenging and resisting apartheid, “the Struggle”, brought about constellations of interest-groups that, as they over decades endured atrocities and persecution, kept the strife for freedom alive and laid the foundation for further pursuits that ultimately contributed considerably to the decisive negotiations and the breakthrough into a new future for all in 1994. The Christian Institute of Southern Africa (CI) is one of the organizations and networks that played an important role in “the Struggle”. A whole range of initiatives, organisations, networks and institutions including churches and related societies shares convictions and methods similar to those that shaped and characterized the CI in the fourteen years of its active engagement between 1963 and 1977. How and to what extent which of those organisations, networks and churches that confessed and acted against apartheid in those decades and those committed similarly at present, followed and follow a similar pattern as the CI in searching for, finding their way and standing their ground for justice against injustice, deserves focus and analysis as shall be embarked on in this essay, in order that their commitment could be seen and evaluated in historical perspective and probably be better understood today. Based on a selection of church-institutions of different confessional traditions on the one and organisations and projects focussing on different aspects in questioning, opposing and resisting theories and practices of segregation and subjugation in the apartheid-era in Southern Africa on the other hand, the survey underlying the essay at hand sets out to identify, highlight and address patterns and modes of conviction and activity resembling the general pattern of commitment observed in the life and work of the CI and to give an outline of the interaction within that constellation – the civil rights’ movement and the churches. The Christian Institute of Southern Africa (CI) was founded on 13 August 1963. It started as an interest-group of predominantly English-speaking white Christians mainly from around Johannesburg and developed into a network of individuals and interest-groups from various confessional traditions and population-groups that were challenging and seeking to overcome apartheid “in church and society”. They perceived their commitment as an attempt to express their ‘obedience to God’. One of the founder-members of the CI, Christiaan Frederik Beyers Naudé [1915-2004], a member of the regional governing body, the synod, in his Church, the Nederduitse Gereformeerde Kerk (NGK), one of the Afrikaans-speaking white Dutch Reformed Churches (DRCs), had been one of South Africa’s theologians and church-members that had attended as delegates the interdenominational conference of the member-churches of the World Council of Churches (WCC) on 7-14 December 1960 at Cottesloe near Johannesburg, the Cottesloe-Consultation, which had been convened at the initiative of the WCC and its member-churches in South Africa, following the escalating and increasingly brutal measures of repression on persons and organisations opposing, protesting against or resisting apartheid. The Sharpeville-Massacre marks a turning-point in the political context world-wide. It is, however, revealing that the Cottesloe-Declaration came ultimately in its Part III to actually mention the Sharpeville-Massacre in a nearly explicit manner – in the wording of the sub-heading “Judicial Commission on the Langa and Sharpeville Incidents” – this only after the said “incidents [! ]” had been described in Part II of the Declaration as a “tension” which was “the result of a long historical development” for which the Declaration contends that “all groups bear responsibility for it” and recommends that “[t]his must also be seen in relation to events in other parts of the world”. In cautious terminology and in a subservient and strikingly obsequious tone, the Consultation “expresses its appreciation for the prompt institution [by the apartheid-regime] of enquiries into the recent disturbances [! ]” and “requests the Government to publish the findings as soon as possible”. The constellation of churches within the Christian Council of South Africa, the forerunner of the SACC, including those that had not been part of the Cottesloe-Consultation responded differently to the escalating repression, a few of them, however, indicating willingness in principle to reconsider their perceptions and standpoints and possibly refrain from practices of segregation and subjugation as a result. Predictably, controversial discussions broke out in response to the Cottesloe-Declaration particularly within those member-churches of the WCC that, like the Afrikaans-speaking white Dutch Reformed Churches (DRCs), outwardly supported or at least condoned apartheid. Reporting on the conference entitled “Cottesloe after 30 years” that was held three decades later – in September 1990, Die Kerkbode, the newsletter of the NGK, had as its heading “Stofstorm rondom Cottesloe lê nog nie heeltemal nie” (“Cottesloe dust-storm has not quite settled [as yet]”). Beyers Naudé, as mouthpiece of the delegation that had represented the white DRCs at Cottesloe, faced as a result of his and their co-authorship and continued approval of the decisions arrived at in that consultation, fierce attacks and vicious intrigues particularly from pro-apartheid circles within his Church, the Nederduitse Gereformeerde Kerk (NGK), and the Afrikaans-speaking white community at large. That resulted in him having to resign and give up his post as pastor, lay down further appointments in that Church and start working primarily for and within the emerging organisation, the Christian Institute (CI). Naudé, who was already serving in the voluntary editorial team of the journal, Pro Veritate [1962-1977], which had been established shortly after the Cottesloe-Consultation and was to become the main publicity-organ of the CI for the following one and a half decades, withdrew his membership in the Broederbond, the pro-apartheid secret-organisation that used to operate also through members and decision-makers at every level and in almost every sphere of the apartheid-regime and the Afrikaans-speaking white churches. The CI had emerged and developed gradually, in the first place more coincidentally and as a reflexive reaction to the status quo: It was neither the Sharpeville-Massacre on 21 March 1960, nor the resulting proclamation of a ‘state of emergency’ by the apartheid-regime and the banning of the African National Congress (ANC) and the Pan Africanist Congress (PAC) on 8 April 1960, nor the respondent interdenominational consultation of the member-churches of the World Council of Churches (WCC) at Cottesloe in December 1960, the Cottesloe-Consultation as such, that ignited in Beyers Naudé, the leading founder-member of the CI, the decisive impulse to openly denounce the apartheid-establishment and rather invest more effort in intensifying and developing the ecumenical perspective that had begun to take shape during the Cottesloe-Consultation. It was rather the polemic and controversial reaction on reports over the Cottesloe-Declaration within the Afrikaans-speaking white DRCs and particularly within the secret-organization, the Broederbond, – the escalation of that controversy -which actually fanned the flames of discontent and brought about the decisive stirring-up of conscience among some members of the main-stream white churches around Beyers Naudé some of whom had shortly before then approved of the Cottesloe-Declaration. In response to the escalating controversy over Naudé’s stand towards the outcome of the Cottesloe Consultation, a process of individual and collective critical self-assessment and self-awareness started and soon developed into an informal network that led to the inauguration of an ecumenical interest-group, the Christian Institute of Southern Africa (CI). This, indeed, is an observation that deserves being focused on and reflected upon from as various angles as can be considered within the essay at hand, more so, since the ongoing attempt to examine the concurrent and the subsequent influence of the CI on church and civil society is meant to lead to insights of at least some substantial meaningfulness for church and society in historical and ecumenical perspective. Bible-study, fellowship-meetings and informal consultations in private-homes in various places as well as public-meetings of persons from diverse population-groups and from various confessional traditions exchanging experiences and perceptions on biblical and socio-political issues, constituted the life of the fledging ecumenical organization and generated critical thought and expression amidst escalating repression. The CI gradually evolved and developed into “a movement based on the German war-time model of a Confessing Church in Southern Africa”. At least in two instances – firstly, in the face of the Schlebusch/Le Grange Commission  and secondly, in the clear stand that the CI took in the “Hammanskraal Resolution” of the SACC in favour of conscientious objection against military conscription  – did the CI most clearly come to live up to the self-set goal of ‘confessing in obedience to God against an unjust regime and openly inviting and motivating others to follow suit’. Not without reason had the CI adopted ‘the German war-time model of a Confessing Church’ as source of encouragement and frame of reference in their pursuit against apartheid: The foundation and measures of the apartheid-system did not only resemble those of the Hitler-regime in pre-war Germany in almost every respect, the protagonists and beneficiaries of the apartheid-system constructed and justified their atrocities in similar terms, with comparable expressions of conviction and in almost identical vocabulary. The Barmen-Declaration (1934) in which the experiences and insights in confessing against National Socialism (Nazism) are spelt out, came to be understood by Beyers Naudé and many within the CI in the early 1960s and later as being relevant and committing in the face of apartheid. Attempts to recall and to implement the Cottesloe-Declaration (1960) consequently quite often reiterated the insights and affirmations propounded in “Barmen” (1934), reclaiming these in trying to stand firm against perceived injustice in a given situation. Consequently, when particularly Desmond Tutu and Allan Boesak each – in 1976 and 1979 respectively – openly confronted state-power, demanding fundamental change, contemporaries and observers in church-congregations, pastoral convents and ecumenical bodies described the venture as the most articulate manner of confessing obedience to God and calling for civil disobedience in prophetical tradition in the face of injustice, reminding of – although not necessarily taking explicit recourse to – the Kirchenkampf [Church Struggle] in pre-War Germany decades earlier. Bible-study and theological training in support of congregations and interest-groups in churches outside the Eurocentric-mainstream, member-churches of what later became known as the African Independent Churches Association (AICA) in particular, as well as consultation and exchange of perceptions with representatives of the emerging Black Consciousness Movement (BCM) (among others: Steve Biko, Barney Pityana, Sabelo Ntwasa and Bennie Khoapa) and Black Theology (Manas Buthelezi, Douglas Makhathini, Ben Ngidi and Elliot Khoza Mgojo among others) and concerted reach-out and cooperation-programs with marginalized communities, availed the CI of an optimal stance within the constellation of initiatives and the networks of organisations challenging and opposing apartheid in public in the aftermath of the Sharpeville-Massacre and the banning of the ANC and the PAC . With Manas Buthelezi and Oshadi Phakathi as staff-members and black Catholic priests including Smangaliso Mkhatshwa as supportive contemporaries in the early 1970s, the CI had ultimately set foot among organizations and initiatives that – in the aftermath of Sharpeville and the banning of the ANC and the PAC – were no longer only protesting and resisting certain practices and measures, but were already in the process of going over to openly challenging the apartheid-regime, demanding fundamental change – a big stride since the formative years a decade earlier that were understandably characterized by a whole range of typical inconsistencies. One instance of such incongruences in the formative years comes to mind: Not even in his attempt to respond to the public reaction on the Cottesloe-Declaration on 18 December 1960, could Beyers Naudé for a moment refrain from the notorious practice among Whites those times of habitually and seemingly subconsciously employing offending and defamatory apartheid-vocabulary – for example “nie-Blanke” (“non-White”), “communists” (a polemic reference to apartheid-opponents intended to undermine their integrity, discredit their motives and goals and justify measures to silence them); Naudé argues apologetically in that controversy – by no means as emphatically as would have been warranted and at least typical of him in defence of the recommendations of a representative conference against misunderstandings, obvious distortions and ongoing political instrumentalisation from within the Afrikaans-speaking white DRCs and the Broederbond in the given situation. The articles and editorials in Pro Veritate and the public statements in the name of the CI right up to the late 1960s were not without similar apartheid-terminology and traces of affinity to the popular teachings and practice of segregation and subjugation; they retained at least an “unconsciously patronising” approach and tone right into the early 1970s. 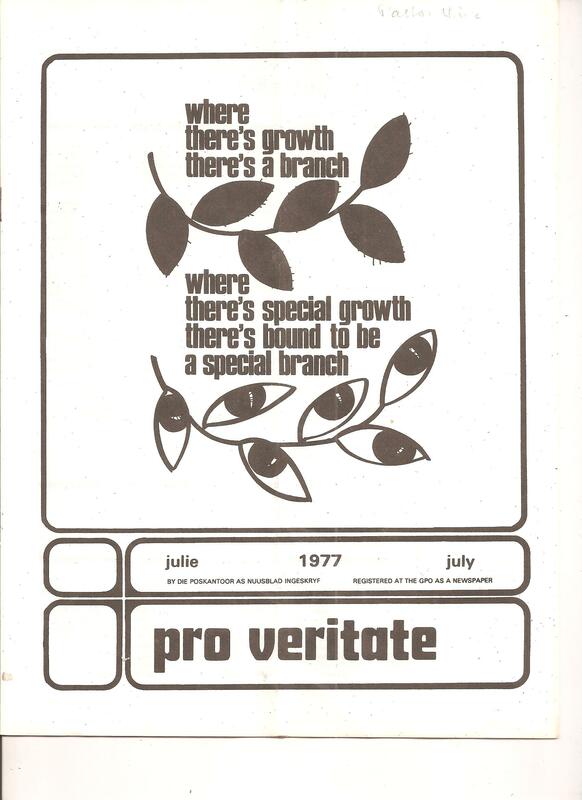 Through its journal, Pro Veritate, and the annual Director’s Report, the CI communicated and documented most of the developments and activities of internal and public interest – a venture that soon gained active support from a growing circle of readers and contributors far beyond the bounds of inner-church communities. Critical and openly polemic reactions from supporters and beneficiaries of apartheid within both the Afrikaans- and the “English-speaking” white church-communities were soon to be accentuated by repressive measures aimed at silencing the publication-organ and its readership – a goal the apartheid-regime believed to have ultimately accomplished by October 1977. Developments in the ecumenical movement at large found room in Pro Veritate and remained within focus in various circles of the CI-membership and associates. These included both the immediate and the unending controversial public discussion following – on the one hand – on the decision of the World Council of Churches (WCC) to launch a Special Fund within its Programme to Combat Racism (PCR) out of which the exiled organizations of the liberation-movement from Southern Africa, among them the ANC, PAC and SWAPO (South West African Peoples’ Organisation), would, like similar other initiatives and projects world-wide, who had applied successfully, receive financial support for their non-violent projects, and – on the other hand – the theological debate around the annual celebration of 16 December to glorify God for the victory of the Voortrekkers in the Battle of “Blood River” . Some of the occasional sermons and public statements published by the CI received wide attention, stirred controversy and ignited activity far beyond the reactionary pro-apartheid networks of the day. The CI was still in the process of embarking onto ‘exploring [- within a common venture with the SACC -] alternative futures’ when in the late-1960s labour-tenants and their families on farms and communities in semi-urban areas were being evicted on a large scale, driven away and dumped in the ‘bantustans’, that had to become their ‘homelands’. Learners and students in semi-urban and rural areas had started attaining growing public attention as they now and again – albeit sporadically – ventured collectively to voice out their grievances against measures they found discriminatory, some of them reaching out as teams on week-ends and during school-holidays to ‘awaken’ and ‘mobilise’ others in the spirit of the fledging movement of black consciousness. Workers in mines, on the docks, in factories and in private households were again frequently resorting to strikes for a fair wage and better work-conditions. The concurrent aggravation of the living conditions for the population-majority prompted the CI, among others, to launch a project that was “to provide facts and analysis which [could] serve as the basis for informed critical judgements on public and church policies”, the Study Project on Christianity in an Apartheid Society (SPRO-CAS) . Through SPRO-CAS, the CI and the SACC sought to ‘challenge our South African society at every level of its existence’. For that purpose, SPRO-CAS was, however, “a somewhat naively conceived venture in that it was hoped that when white South Africans were provided with more information on the injustices wrought by existing policies, and offered a range of alternative policies, they would be prompted to take a vigorous stand against apartheid”. Peter Walshe observes: “Of course nothing like this occurred. Rather the [CI] had to struggle through SPROCAS I, SPROCAS II and a range of later initiates in an effort not to be overtaken by events as blacks tried to take the future into their own hands and showed no inclination to wait any longer for some hoped-for response from whites”. SPRO-CAS ultimately proved to have been nothing more than “an elaborate, but [much too] imaginative, attempt”. Retrospectively, one could on the one hand resume: In spite of the series of successful initiatives that the CI managed to take especially in the late 1960s in reaching out and striking common-ground with a variety of non-segregationist activists, organisations and churches locally and abroad, it, however, was and remained an organisation that was centred in and focussed on the white community and its interests and perspectives. Some contemporary issues including the tactical attacks marking the launch of uMkhonto weSizwe (MK) on 16 December 1961, the subsequent public upheavals up to the end of the Rivonia Trial (1964) and even the contributions by outspoken Christian opponents of apartheid like Chief Albert Luthuli, Nobel Peace Prize Laureate (1960), seem to have simply remained out of focus, or were at best reluctantly taken notice of, if not purposely ignored by the CI and its supporters, whatever the reasons might have been. On the other hand, it is true that, notwithstanding the contradictions typical of a movement evolving gradually from within a complex system it intends to restructure, the CI, indeed, did soon become “a thoroughly disturbing prophetic voice” which continued criticizing and describing the impact of apartheid on South Africa’s population-majority, condemning the structures of injustice, assailing complacency, struggling to articulate an alternative vision for society and trying to discern appropriate methods to bring something of that vision into being. When in 1982 David Bosch, renowned theologian from the NGK, responded to the call to submit to the Eloff-Commission of Inquiry a statement on the theological profile and the activities of the SACC, an outline and an explanation of particular principles and traditions was tabled, arguing and explaining as to what “the Church [inferably: the SACC]” – following acknowledged Reformed theological schools of thought – was meant to be and what it ought to or should be in the given context in South Africa. This monumental study summarises profoundly the various perceptions nurtured and gained in consultations, Bible-study circles, reach-out initiatives, academic seminars and public controversies since the early 1960s that were the primary domain of the CI which was contrary to popular NGK-standpoints and was to serve as point of departure and frame of reference for further initiatives and ventures including the document that became known as the Belhar Confession [1982 and the Kairos Document . The post-missionary ‘daughter-churches’ of the white-controlled DRCs had been conceived and were managed as separate entities for ‘non-white’ converts and their descendants. After Cottesloe some congregations and interest-groups within these churches started reasserting their ground with growing self-esteem and gradually turned to confess and act more substantially against segregation and subjugation, steadily developing a profile differing from that prescribed by and inherited from the white-controlled ‘mother-church’, the NGK. The black DRCs grew into the constellation of organisations and churches that were soon to work together in various projects and share important pronouncements and ventures against apartheid, of late also as members of the South African Council of Churches (SACC). Some of the most articulate theologians and leaders of the then progressing black DRCs, Allan Boesak, Sam Buti and Shun Govender did not only contribute considerably to nurturing the analysis and promoting sound reflection on biblical themes within their church and the black-theology–movement in the 1970s, they were also efficiently instrumental in kindling and furthering the unity-talks that were to affirm confessional foundations and help overcome the inherited disunity more especially among the churches of Reformed tradition in Southern Africa. The document that later became known as the “Belhar Confession” , which was subsequently adopted by the Synod of the Dutch Reformed Mission Church in 1986, is one of the pronouncements of ecumenical significance from within that inner-church movement. Although progress has in the meantime been made to have this confessional milestone acknowledged and hopefully also adopted by the wider DRC-family, it still remains a contested document to date. The process of reaffirmation that the black DRCs initiated in the aftermath of Cottesloe gained momentum through the occasional contacts with the AICA and the IDAMASA (Interdenominational African Ministers Association in South Africa) in the late 1960s on the one hand and the subsequent continual exchange within the spectrum around the CI and related initiatives and networks including the Broeder Kring (later Belydende Kring), an informal think-tank and forum of theologians and associates from the black DRCs rooted in the Western Cape, on the other hand, and enabled the black DRCs to gradually assume the function of some sort of ‘a matrix’ within which inter-black and inter-confessional contacts [would] grow. The growing number of those engaged in implementing the goals and objectives of the CI in the 1960s proved consistently mindful of recalling and reaffirming the values and convictions which they considered unalienable and which were to guide each effort envisaged and undertaken. This was soon to be expressed more profoundly in pronouncements including the statement some of them had co-authored in establishing the South African Council of Churches (SACC) to take over from the Christian Council of South Africa in 1968 as agency and ‘umbrella-organization’ of churches in South Africa – the document, “A Message to the People of South Africa”. In public statements that some of them made from time to time with regard to their personal stand in the controversial issues including the public discussion around the Special Fund of the WCC’s Programme to Combat Racism (PRC), or in the reasons some of them gave for example for refusing to testify before the “Select Commission of Inquiry into certain Organisations”, the “Schlebusch/Le Grange-Commission”, or in their arguments for withdrawal of investments and the end of trade and economic cooperation with the apartheid-regime, or in their reasons for favouring and recommending the option for conscientious objection against compulsory military conscription, up to the realisation by a few of them, that it had in the meantime become a matter of fact for them to openly pledge solidarity with or at least no longer indiscriminately condemn those who had resorted to resisting and fighting apartheid underground and in exile within the armed units of the liberation-struggle including uMkhonto weSizwe (MK), they, indeed, each stood their ground and ventured as a civil rights’ movement that the apartheid-regime and the white DRCs could simply no longer ignore. On the one hand the white DRCs and almost the entire Afrikaans-speaking white community, supporters and beneficiaries of the apartheid-system, continued almost similarly determined and uncompromisingly to highlight and affirm certain options in interpreting and implementing biblical teachings which they held in high esteem and which they felt were being unduly questioned and were to be defended against the growing move of the CI and its supporters. On the other hand, congregations and governing bodies of churches outside the white-controlled main-stream, which had come to be known as African Independent Churches (later also: African Initiated Churches), as well as leaders and activists in various civil organisations questioning and challenging apartheid in the aftermath of the Sharpeville-Massacre, most of whom were operating within the Black Consciousness Movement (BCM), discovered the CI and dealt with it as a genuine and reliable partner in the pursuit for liberation. This holds true also for networks and some personalities and congregations from within the “English-speaking churches” including the Roman Catholic Church. Interest-groups and initiatives throughout South Africa and South-West Africa (Namibia) with concerns stretching from conscientious objection against military conscription up to those of schoolchildren and youth in the face of Bantu Education in Soweto and elsewhere as well as leaders and activists in the liberation-movement underground and in exile, had by 1976 grown to know of and were in some or other way familiar with the statements, meetings, consultations and projects of the CI and shared the common goal to overcome segregation and oppression. Through the commitment of the CI and related networks in the fourteen years of its active participation in the Struggle, the ecumenical movement world-wide – particularly within the member-churches of the World Council of Churches (WCC) in Europe and North America – became part of the movement questioning and resisting apartheid and contributed considerably towards keeping the world-community informed of the challenge and the ongoing pursuit. Most important of all in this regard: The support that the CI used to give to promote the literacy-programmes, bible-study courses, pastoral training and women’s projects of the AICA and the various initiatives and projects of the Black Consciousness Movement (BCM), enabled the CI to gain closer insight and acquire admittance into motivated oppositional circles in rural and semi-urban sectors of the black community in the late 1960s. This set a process in motion that was to reactivate and keep even the ecumenical movement abroad and the world-community at least continually informed of the ongoing multi-facetted Struggle to end apartheid. The interaction between the CI and contemporary institutions and organizations was the outcome of a merely coincidental process that occurred in a reciprocal manner. The CI had the advantage of a new-comer in the scene opposing apartheid paired with a lightly fluctuating but steadily growing and diversified network of well-wishers and financial supporters also in Western Europe and North America. Consequently, the CI could advance relatively swiftly in moving from “Phase One” to “Phase Two” – from identifying and articulating issues of concern to undertaking to implementing them within an ‘aboveground setup’ outside the structures of public authority and power. In that process the CI ventured and was readily accepted among contemporary institutions and organizations as partner who in turn willingly availed a commonly shared frame of reference, a reservoir of acquired skills, a publicity-platform, access to funds and office-infrastructure. The CI became part of contemporary networks, learnt and shared their ‘language’ and grew to understand and appreciate their points of departure, perceptions, strategies and their techniques. These were, among others, the AIC and the BCM as well as the former “daughter-churches” of the NGK, the member-churches of the SACC, IDAMASA and the forerunner-initiatives of the ECC (End Conscription Campaign]. The experience of being a common target of indiscriminate hostile measures (by retaliating addressees – the apartheid-state and the white DRCs in particular) motivates the interest-groups and organizations concerned to rather concentrate on set priorities and to strive for reliable relations among one another – to simply “go it alone!” Without always explicitly agreeing on aspects or modalities, interest-groups and organizations of diverse character often accepted, shared and even adopted initiatives and stands in issues of common concern pretty readily. In the face of intimidation and pressure around the Schlebusch/Le Grange Commission, the detentions and bannings in the early 1970s, the CI and contemporary organizations and interest-groups developed into an interconnected constellation that covered a wide spectrum of issues of concern in opposition and in resistance to norm and authority under apartheid. Processes leading to the development of a viable civil rights’ movement ran concurrently and consecutively and overlapped, the later phases reviving and complementing the earlier and bringing these to fruition almost unawares. When on 19 October 1977 eighteen organisations were declared prohibited, they retrospectively gained esteem in the eyes of the oppressed majority-population and became the foundation-stone for the civil rights’ movement of the following decades. Factors determining interaction among various contemporaries in pursuit of a common goal in a given situation could be touched upon in briefly recalling the emergence and some of the activities in almost one and a half decade after Sharpeville and the founding of the CI. Contradictory statements and incongruous options determining the nature and the extent of conflicts and endeavours at resolving them are characteristic of society and churches far beyond the given context of the apartheid-era [1948-1994]. Individual and collective contributions to the struggle in and around the CI and the SACC in the aftermath of the Hammanskraal Resolution  came to fruition and brought their impact to bear most effectively in the public debate that gained new momentum in response to the measures of 19 October 1977 when the apartheid regime instituted a judicial commission of enquiry, the Eloff-Commission, which was to investigate the inception, development, objects, history and activities of the SACC as well as organizations and people giving money or assets to the Council. When in 1982 David Bosch, renowned theologian – academic and practitioner – from the NGK and a profiled cooperative contemporary of the CI of international standing from within the inner circles of the Afrikaans-speaking mainstream, was subpoenaed and agreed to submit a statement to the Eloff-Commission, he tabled an outline and an explanation of particular principles and traditions of Christian theology, arguing and explaining as to what “the Church [inferably: the SACC]” – following acknowledged Reformed theological schools of thought – was meant to be and what it ought to or should be in the given context in South Africa. This monumental study summarises profoundly the various perceptions nurtured and gained in consultations, Bible-study circles, reach-out initiatives, academic seminars and public controversies since the early 1960s that were the primary domain of the CI and the SACC which were fundamentally contrary to popular NGK-standpoints and were to serve as point of departure and frame of reference for further initiatives and ventures in the aftermath of the Hammanskraal Resolution  including the pronouncements and documents that became known as the Belhar Confession  and the Kairos Document . The brief glimpse into the life and activities of the CI in interaction with the churches and civil society in the apartheid-era illustrates the complex nature of continuities and discontinuities in historical dimensions involving theology and politics and could help identify and determine similar developments under related conditions also in future. Annonieme Versameling in Verband met Beyers Naudé, die Christelike Instituut en aanverwante Dokumente, Saamgestel deur Murray Coetzee, Beyers Naudé Sentrum vir Publieke Teologie, Stellenbosch Universiteit 2012. Bekenntnis und Widerstand. Kirchen Südafrikas im Konflikt mit dem Staat. Dokumente zur Untersuchung des Südafrikanischen Kirchenrats durch die Eloff-Kommission, Evangelisches Missionswerk im Bereich der Bundesrepublik Deutschland und Berlin West e.V. (EMW) (ed. ), Hamburg 1983. Black People’s Convention (External Office): Solidarity, Vol 1, London undated [1977?]. Coetzee, Murray, Len Hansen, Robert Vosloo (eds. ): Vreesloos Gehoorsaam. `n Keur uit Beyers Naudé se preke van 1939 tot 1977. Stellenbosch (undated). Chikane, Frank: A Critical Examination of the Theology and Praxis of the SACC, 1968-1988, M.A. thesis, University of Natal, 1992. Christian Institute: Director’s Report, Johannesburg 1977. Conscription and Resistance to Conscription. A brief History. Alan Paton Centre and Struggle Archives. Pietermaritzburg: P9/1/1/1. Heaney, Michael John: Beyers Naudé, ekumeniese Baanbreker in Suid-Afrika: 1960-1994. Proefskrif voorgelê ter voldoening aan die vereistes vir die graad Philosphiae Doctor (PhD) in die Departement Godsdiens en Sendingwetenskap, Fakulteit Teologie, Universiteit van Pretoria, Promotor: Prof PGJ Meiring, Februarie 2004. pp. 377. Hewson, L.A. (ed. ): Cottesloe Consultation. The Report of the Consultation among South African Member Churches of the World Council of Churches, 7-14 December 1960, Johannesburg 1961. Inligtingstuk oor: “Foreign investment in SA” deur G Buthelezi en B Naudé. 10 Maart 1976, in: Versameling, Vol X. A.3.14.16. Kommentaar deur H Schlimm op: “Gehoorsamheid aan God of Regering”, 28 November 1973. Kommissie van ondersoek na sekere organisasies (CI en ander) onder voorsitterskap van onderskeidelik JT Kruger, AL Schlebusch en L le Grange (4 Julie 1972 – Desember 1973). Finale verslag 28 Mei 1975, in: Versameling, Vol IX. A.3.22.2. Kommissie van ondersoek na sekere organisasies (CI en ander) onder voorsitterskap van onderskeidelik JT Kruger, AL Schlebusch en L le Grange (4 Julie 1972 – Desember 1973), in: Versameling, Vol IX. A.3.22.1. Mbanjwa, Thoko (ed. ): Black Review 1974/5, Durban 1975. Missiological Institute: Our Approach to the Independent Church Movement in South Africa. Lectures of the First Missiological Course of the Missiological Institute at the Lutheran Theological College, Maphumulo, from 30th September to 6th October, 1965. Positiewe en negatiewe reaksie op die CI en aanverwante organisasies, in: Versameling, Vol VI. A.3.16. Program for Social Change (opvolg van Spro-cas wat in Des 1973 ontbind is), in: Versameling, Vol VIII. A.3.21.3. Rambally, Asha (ed. ): Black Review 1975-6, Durban 1977. Randall, Peter: Towards Social Change. Report of the Social Commission of the Study Project on Christianity in Apartheid Society, Spro-cas Publication Number 10, Johannesburg 1971. Randall, Peter: South Africa’s Political Alternatives. Report of the Political Commission of the Study Project on Christianity in Apartheid Society, Spro-cas Publication Number 10, Johannesburg 1973. Response of the South African Council of Churches to the WCC Programme to Combat Racism [1969-1979]: a Documentation, February 8, 1980. Respons op verskeie etiese kwessies deur Beyers Naudé. 2 Desember 1970, in: Annonieme-Versameling, Vol X. A.3.14.2. Ross, Gavin A.: The Christian Institute of Southern Africa. Its historical and political Importance, Submitted in partial fulfilment of the requirements for the degree of Master of Arts in the Faculty of Social Science, Politics Department, Edinburgh University 1980. South African Institute of Race Relations: Black Grahamstown. The Agony of a Community, TRH Davenport, Johannesburg 1980. South African Law and the Conscientious Objector. 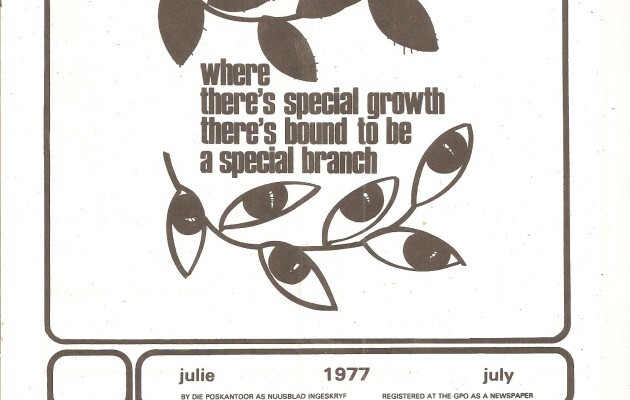 A NUSAS Milcom Publication edited by Andrew Smail and published by the Committee of Investigation into Service in the SADF, youth Preparedness Programmes and Alternative National Service of the National Union of South African Students, Rondebosch 1979. South African Outlook, Johannesburg 1976. Study Project on Christianity in Apartheid Society (Spro-cas I), April 1969 – Augustus 1972. Versameling, Vol VIII. A.3.21.1. Study Project on Christianity in Apartheid Society (Spro-cas 2), April 1969 – Augustus 1972. Versameling, Vol VIII. A.3.21.2. Study Project on Christianity in Apartheid Society (Spro-cas): Education Beyond Apartheid, Report of the Education Commission of the Study Project on Christianity in Apartheid Society, Spro-cas Publication Number 5, Johannesburg 1971. The “Coping With Conscription” Course. All you ever wanted to know about the ins and outs of conscription but were afraid to ask … Sept-Oct 1989 brought to you by the Conscription Advice Service. Call-up Crisis? Call up CAS! 0331-944 074. Alan Paton Centre & Struggle Archives P9/1/1/1. Van der Riet, Ryno Louis: Beyers Naudé: advocate of hope? A Historical and Theological Reading of his Public Addresses, Thesis presented in fulfilment of the requirements for the degree of Master of Theology in the Faculty of Theology at Stellenbosch University, March 2013. Verklaring van CI oor beleggings in SA. 26 Mei 1977, in: Versameling, Vol X. A.3.14.26. World Council of Churches: Mission in South Africa, April–December 1960. Adonis, J.C.: Dr Beyers Naudé and Church Unification in the Family of Dutch Reformed Churches, in: The Legacy of Beyers Naudé. Beyers Naudé Centre Series on Public Theology, Volume 1, Stellenbosch 2005, 117-126. African Independent Churches Association (AICA), in: Versameling 2012. Anthonissen, C.A. : Beyers Naudé’s Relevance for the DRC Today, in: The Legacy of Beyers Naudé. Beyers Naudé Centre Series on Public Theology, Volume 1, Stellenbosch 2005, 143-150. Baartman, Ernest: The Black and the Church, in: Pro Veritate. Johannesburg, April 1973. Bax, Douglas: Interview (conducted at Rondebosch, Cape Town, on 15 July 2013 by Murray Coetzee. Interview transcribed by Veronica Coetzee, 2 May 2014), in: Murray Coetzee, Retief Muller, Len Hansen (eds): Cultivating Seeds of Hope. Conversation on the Life of Beyers Naudé, Stellenbosch 2015, 225-234. Bengheza, C.J. : African Independent Churches’ Movement, in: Piet Meiring (ed. ), Stemme uit die Swart Kerk, Cape Town 1975, 129-140. Boesak, Allan: Zwarte Theologie, in: Voorlopig, Delft-Kampen 1973; in: Pro Veritate, Johannesburg, February 1974. Boesak, Allan (ed. ): Om het zwart te zeggen, Kampen 1976. Boesak, Allan: Farewell To Innocence. A Social-Ethical Study of Black Theology and Black Power, Johannesburg 1977. Boesak, Allan A.: Gerechtigkeit erhöht ein Volk. Texte aus dem Widerstand. Neukirchen-Vluyn 1985. Boesak, Allan: Interview (conducted in Soweto, Gauteng, on 4 September 2014 by Murray Coetzee. Interview transcribed by Veronica Coetzee, 18 January 2015), in: Murray Coetzee, Retief Muller, Len Hansen (ds): Cultivating Seeds of Hope. Conversation on the Life of Beyers Naudé, Stellenbosch 2015, 119-131. Bosch, David I.: Der Südafrikanische Kirchenrat (SACC) – Ein Bericht für die Untersuchungskommission, in: Evangelisches Missionswerk im Bereich der Bundesrepublik Deutschland und Berlin West e.V. (EMW) (ed.). Bekenntnis und Widerstand. Kirchen Südafrikas im Konflikt mit dem Staat. Dokumente zur Untersuchung des Südafrikanischen Kirchenrats (SACC) durch die Eloff-Kommission. Hamburg 1983, 137-151. Brickhill, Joan: Race against Race. South Africa’s “Multinational” Sport Fraud, London 1976. Buthelezi, Manas: Christelike Instituut van Suid-Afrika, in: Piet Meiring (ed.). Stemme uit die Swart Kerk. Kaapstad 1975, 141-152. Buthelezi, Manas: The Meaning of the Christian Institute for Black South Africa, in: L.W.F. Information. Geneva, June 1975. Buthelezi, Manas: Black Theology and the Le Grange-Schlebusch Commission, in: Pro Veritate. Johannesburg 1975. Buthelezi, Manas: Interview (conducted in Soweto on 24 January 2013 by Murray Coetzee. Interview transcribed by Veronica Coetzee, 28 March 2014), in: Murray Coetzee, Retief Muller, Len Hansen (eds): Cultivating Seeds of Hope. Conversation on the Life of Beyers Naudé, Stellenbosch 2015, 243-249. Buthelezi, Peter: Rooms-Katolieke Biskop van Johannesburg, in: Piet Meiring (ed. ), Stemme uit die Swart Kerk. Kaapstad 1975, 57-67. Buti, Sam: Die Nederduitse Gereformeerde Kerk in Afrika, in: Piet Meiring (ed. ), Stemme uit die Swart Kerk. Kaapstad 1975, 1-21. Cochrane, James: Christian Resistance to Apartheid: Periodisation, Prognosis, in: Martin Prozesky (ed. ), Christianity in South Africa, Bergvlei 1990, 81-100. Cochrane, Jim: Interview (conducted in Cape Town via Skype from Germany, on 11 November 2014 by Murray Coetzee. Transcribed by Veronica Coetzee on 16 October 2014), in: Murray Coetzee, Retief Muller, Len Hansen (ds): Cultivating Seeds of Hope. Conversation on the Life of Beyers Naudé, Stellenbosch 2015, 63-77. Coetzee, Murray Hermanus: Die “kritiese Stem” teen Apartheidsteologien in die Ned Geref Kerk (1905-1974). ‘n Analise van die Bydraes van Ben Marais en Beyers Naudé. Wellington: Bybel-Media. 2011. Coetzee, Murray, Retief Muller, Len Hansen (eds): Cultivating Seeds of Hope. Conversation on the Life of Beyers Naudé, Stellenbosch 2015,. De Gruchy, John: A short history of the Christian Institute. In: Charles Villa-Vicencio and John de Gruchy (eds. ), Resistance and Hope: South African Essays in Honouring of Beyers Naudé, Cape Town 1985, 14-26. De Gruchy, J. W.: In einer Zeit der Krise Zeugnis ablegen, in: Dienste in Übersee (ed.). Christen im Widerstand. Die Diskussion um das südafrikanische Kairos-Dokument. Stuttgart 1987, 78-85. De Gruchy, John W. et al. : The Church Struggle in South Africa, 25th anniversary edition, Minneapolis 2005. Govender, Shun: Indian Reformed Church, in: Piet Meiring (ed. ), Stemme uit die Swart Kerk, Cape Town 1975, 34-43. Hain, Peter: Don’t Play with Apartheid. The Background to the Stop the Seventy Tour Campaign, London 1971. Hewson, L. A. (ed. ): Cottesloe consultation: the Report of the Consultation among South African Member-churches of the World Council of Churches, Johannesburg 1961. Horrell, Muriel: Introduction to South Africa. Basic Facts and Figures, Johannesburg 1968. Karis, Thomas G. and Gail M. Gerhart: From Protest to Challenge. A Documentary History of African Politics in South Africa, 1882-1990. Nadir and Resurgence, 1964-1979, Volume 5, Auckland Park 2013. Khoapa, B.A. (ed. ): Black Review 1972, Durban 1973. Kleinschmidt, Horst: Interview (conducted at St. James, Cape Town, 13 August 2013 by Murray Coetzee. Interview transcribed by Veronica Coetzee, 2 June 2014), in: Murray Coetzee, Retief Muller, Len Hansen (eds): Cultivating Seeds of Hope. Conversation on the Life of Beyers Naudé, Stellenbosch 2015, 13-30. Knighton-Fitt, Jean: Beyond Fear [Theo and Helen Kotze], Claremont 2003. Levine, Lou (ed. ): Hope Beyond Apartheid. The Peter Kerchhoff Years of PACSA 1979-1999, Pietermaritzburg 2002. Linnemann-Perrin, Christine: Die politische Verantwortung der Kirchen in Südkorea und Südafrika . Studien zur ökumenischen politischen Ethik, München: Chr. Kaiser 1992. Lodge, Tom: Sharpeville: An Apartheid Massacre and its Consequences, Oxford | New York 2011. Losaba, Andrew and John Mothupi: Die Metodiste Kerk van Suid-Afrika, in: Piet Meiring (ed.). Stemme uit die Swart Kerk. Kaapstad 1975, 44-56. Lubbe, Gerrie: Living in multifaith South Africa, in Leonard Hulley, Louise Kretzschmar and Luke Lungile Pato (eds. ): Archbishop Tutu. Prophetic Witness in South Africa, Cape Town | Pretoria | Johannesburg 1996, 241-256. Makhathini, Douglas: Die Evangelies-Lutherse Kerk van Suid-Afrika, in: Piet Meiring (ed.). Stemme uit die Swart Kerk, Kaapstad 1975, 109-121. Mayathula, V.M. : African Independent Churches Contribution to a Relevant Theology, in Hans-Jürgen Becken. Relevant Theology for Africa. Report on a Consultation of the Missiological Institute at Lutheran Theological College, Maphumulo, Natal, 12-21, 1972, 174-177. Mayson, Cedric: Interview (conducted at St. James, Cape Town, on 23 March 2012 by Murray Coetzee. Transcribed by Veronica Coetzee on 16 October 2014), 55-62. Mazamisa, Weli: Interview (conducted at Stellenbosch on 5 December 2014 by Murray Coetzee. Interview transcribed by Veronica Coetzee, 7 December 2014), in: Murray Coetzee, Retief Muller, Len Hansen (eds): Cultivating Seeds of Hope. Conversation on the Life of Beyers Naudé, Stellenbosch 2015, 145-151. Meiring, Piet (ed. ): Stemme uit die Swart Kerk, Cape Town 1975. Meiring, Piet: Interview (conducted at UNISA, Pretoria, on 13 January 2013 by Murray Coetzee. Interview transcribed by Veronica Coetzee, 2 March 2014), in: Murray Coetzee, Retief Muller, Len Hansen (eds): Cultivating Seeds of Hope. Conversation on the Life of Beyers Naudé, Stellenbosch 2015, 187-194. Mkhatshwa, P.M., Moetapele, D., Louwfant, J.L., Mokoka, C. and A. Mabona: Black Priests’ Manifesto, 23 January 1970, in: Karis and Gerhart, Protest, 435-438. Mofokeng, Takatso: Black Theology in South Africa: Achievements, Problems and Prospects, in: Martin Prozesky (ed. ): Christianity in South Africa, Bergvlei 1990, 149-167. Moore, Basil (ed. ): Schwarze Theologie. Dokumente einer Bewegung, Göttingen 1973. Moroney, Sean and Linda Ensor (Research Dept. SAIRR) (eds. ): The Silenced. Bannings in South Africa, Johannesburg 1979. Mosala, Itumeleng J.: Spirituality and Struggle: Black and African Theologies, in: Charles Villa-Vicencio and Carl Niehaus (eds. ): Many Cultures, One Nation. Festschrift for Beyers Naudé. Cape Town | Johannesburg | Pretoria 1995, 79-89. Mpepele, Z.S. : Die Presbiteriaanse Kerk van Suid-Afrika, in: Piet Meiring (ed. ): Stemme uit die Swart Kerk. Kaapstad 1975, 93-108. Naudé, Beyers: My Land van Hoop. Die Lewe van Beyers Naudé. Johannesburg 1995. Naudé, Beyers: Christian Involvement in the Struggle for Human Rights and Justice, in: The Legacy of Naudé, B: Afrikaans churches in danger of confusion (translation of an article originally published in the Sunday newspaper Dagbreek en Sondagnuus on 18 December). Cottesloe-documents, Dutch Reformed Church Archives, Stellenbosch 1960a. Naudé, B: Gehoorsaamheid – aan wie? Preek. Beyers Naudé Argiewe, Stellenbosch 1960b. Naudé, B: Die profetiese roeping van die kerk in hierdie tyd. Beyers Naudé Argiewe, Stellenbosch 1961. Naudé, Beyers: Beyers Naudé Centre Series on Public Theology, Volume 1. Stellenbosch 2005, 111-116. Naudé, C.F.B. : Our Theological Responsibility for the Ministry of the African Independent Churches, in: Missiological Institute: Our Approach to the Independent Church Movement in South Africa. Lectures of the First Missiological Course of the Missiological Institute at the Lutheran Theological College, Maphumulo, from 30th September to 6th October, 1965, 206-214. Nash, Margaret: Ecumenical Movement in the 1960s. Johannesburg 1975. Ndebele, Njabulo S.: Iph’ iNdlela? Finding our Way into the Future, in: The Steve Biko Foundation and Pan Macmillan. The Steve Biko Memorial Lectures 2000-2008. Johannesburg 2009, 5-20. Ngakane, Maurice: Die Suid-Afrikaanse Raad van Kerke, in: Piet Meiring (ed. ): Stemme uit die Swart Kerk. Kaapstad 1975, 153-166. Nolan, Albert: Interview (conducted in Johannesburg on 20 January 2013 by Murray Coetzee. Interview transcribed by Veronica Coetzee, 21 February 2014), in: Murray Coetzee, Retief Muller, Len Hansen (eds): Cultivating Seeds of Hope. Conversation on the Life of Beyers Naudé, Stellenbosch 2015, 211-216. Nürnberger, Klaus: The Impact of Christianity on Socio-Economic Developments in South Africa, in: Martin Prozesky (ed. ): Christianity in South Africa. Bergvlei 1990, 149-167. Pauw, J.C.: The Life and Legacy of Beyers Naudé. In: THE LEGACY OF BEYERS NAUDÉ. Beyers Naudé Centre Series on Public Theology. Volume I. Stellenbosch 2005. 7-24. Pityana, Barney: Interview (conducted in Port Elizabeth on28 November 2013 by Eugene Malan. Interview transcribed by Veronica Coetzee, 23 June 2014), 235-242. Prozesky, Martin: Implications of Apartheid for Christianity in South Africa, in: Martin Prozesky (ed. ): Christianity in South Africa. Bergvlei 1990, 122-146. Rabothata, A.: How far can Christians and Non-Christians work together in Social and Religious Spheres? In: Hans-Jürgen Becken. Relevant Theology for Africa. Report on a Consultation of the Missiological Institute at Lutheran Theological College, Maphumulo, Natal, 12-21, 1972, 178-180. Ryan, Colleen: BEYERS NAUDÉ. Pilgrimage of Faith, Cape Town 1990. Sjollema, Boudewijn: Interview (conducted in Bellville, South Africa, on 30 October 2014 by Murray Coetzee. Interview transcribed by Veronica Coetzee, 24 November 2014), 307-312. Smit, Dirkie: Interview (conducted at Stellenbosch on 1 August 2013 by Murray Coetzee. Interview transcribed by Veronica Coetzee, 19 May 2014), in: Murray Coetzee, Retief Muller, Len Hansen (eds): Cultivating Seeds of Hope. Conversation on the Life of Beyers Naudé, Stellenbosch 2015, 159-166. South African Congress of Trade Unions: Basebetsi Mekoting. Mine Workers Conditions in South Africa. London 1976. Spence, Jack: South Africa and the Modern World. The Major Sources of Conflict between South Africa and the United Nations, in: Wilson, Monica and Leonard Thompson (eds. ): The Oxford History of South Africa. II. South Africa 1870-1966. Oxford 1971, 513. Swart, C. F.: Politieke Profiele ten opsigte van Kontemporêre Aangeleenthede van die Blanke Grootstedelike Bevolking van die Witwatersrand, Johannesburg: Rand Afrikaans Universiteit 1977. Tsebe, John: Anglikaanse Kerk (The Church of the Province of South Africa), in: Piet Meiring (ed. ): Stemme uit die Swart Kerk, Cape Town 1975, 68-77. Tutu, Desmond: Versöhnung ist unteilbar. Biblische Interpretationen zur Schwarzen Theologie, Wuppertal 1984. Tutu, Desmond: No Future without Forgiveness, Johannesburg 1999. Tutu, Desmond: South Africa: A Scintillating Success Waiting to Happen, in: The Steve Biko Foundation and Pan Macmillan. The Steve Biko Memorial Lectures 2000-2008, Johannesburg 2009, 5-20. Tutu, Desmond: Interview (conducted in Milnerton, Cape Town, on 17 December 2013 by Murray Coetzee. Interview transcribed by Veronica Coetzee, 16 June 2014), in: Murray Coetzee, Retief Muller, Len Hansen (eds): Cultivating Seeds of Hope. Conversation on the Life of Beyers Naudé, Stellenbosch 2015, 217-220. Van Selms, A.: Church and Secret Organisations. Pamphlet. Undated. Villa-Vicencio, Charles: The Ghost of Cottesloe … A Soweto theological postscript, in: South African Outlook, Johannesburg 1976, 108-109. Villa-Vicencio, Charles: Eine allgegenwärtige Häresie: Rassismus und die “englischsprachigen Kirchen”, in: Bekenntnis und Widerstand. Kirchen Südafrikas im Konflikt mit dem Staat. Dokumente zur Untersuchung des Südafrikanischen Kirchenrats durch die Eloff-Kommission, Evangelisches Missionswerk im Bereich der Bundesrepublik Deutschland und Berlin West e.V. (EMW) (ed. ), Hamburg 1983, 537-553). Villa-Vicencio, Charles: When Violence Begets Violence: Is the Armed Struggle Justified?, in: Martin Prozesky (ed.). Christianity in South Africa. Bergvlei 1990, 193-207. Villa-Vicencio, Charles: Telling One Another Stories: Towards a Theology of Reconciliation, in: Charles Villa-Vicencio and Carl Niehaus (eds. ), Many Cultures, One Nation. Festschrift for Beyers Naudé. Cape Town | Johannesburg | Pretoria 1995, 105-121. Villa-Vicencio, Charles: Interview (conducted at Claremont, Cape Town, on 8 August 2013 by Murray Coetzee. Interview transcribed by Veronica Coetzee, 10 June 2014), 31-42. Vosloo, Robert: The Dutch Reformed Church, Beyers Naudé and the ghost of Cottesloe. Paper at the Annual Meeting of the Church Historical Society of Southern Africa (CHSSA) in Potchefstroom, 16–18 August 2010. Walshe, Peter: Church versus State in South Africa. The Case of the Christian Institute, London | New York 1983. Watts, H. L. A.: Social and Demographic Portrait of English-Speaking White South Africans, 1974. Weßler, Rudolf (ed. ): Südafrikas Christen vor Gericht. Der Fall Beyers Naudé und das Christliche Institut. Wuppertal 1977. Wilkins, Ivor and Hans Strydom: The Super-Afrikaners. Inside the Afrikaner Broederbond. Johannesburg: Jonathan Ball Publishers 1978. Wilson, Francis: Migrant Labour in South Africa. Report to the South African Council of Churches, Johannesburg 1972. Wittenberg, G.H. : Nachfolge Jesu in der politischen Situation Südafrikas, in: Dienste in Übersee (ed.). Christen im Widerstand. Die Diskussion um das südafrikanische Kairos-Dokument, Stuttgart 1987, 71-77. Zulu, Alphaeus: Whither Black Theology? In: Pro Veritate. Johannesburg, March 1973. © Ben Khumalo-Seegelken, Theologian, Social-Scientist and Human-Rights’ Activist, lived at iMbali and KwaPata near Pietermaritzburg (South Africa) and worked – in the employ of the Edendale Lay Ecumenical Centre [1972-1975] – with the youth in and around Edendale, reaching out to Pietermaritzburg, Durban and surroundings with initiatives and ventures to defy apartheid and to equip young people with information, knowledge and skills to participate effectively in “the Struggle”, escaped detention and attained political asylum in West Germany , lives and works in a variety of civil-rights’ networks both in South Africa and in Germany. These are, in the first place, Peter Walshe’s “Church versus State in South Africa” (1983), L.A. Hewson’s, “Cottesloe Consultation” (1961), Manas Buthelezi’s “The Meaning of the Christian Institute for Black South Africa” (1975) and “Black Theology and the Le Grange-Schlebusch Commission” (1975), John (and Steve) de Gruchy’s “The Church Struggle in South Africa” (1979/2005), Robert Vosloo’s “The Dutch Reformed Church, Beyers Naudé and the ghost of Cottesloe” (2010), Thomas Karis’ and Gail Gerhart’s “From Protest to Challenge” (2013) and, of course, Beyers Naudé’s and Theo Kotze’s (auto)biographies “My Land van Hoop” (1995) and “Beyond Fear” (2003) respectively. The term “English-speaking churches” applied to those of British or European descent – the Anglicans, Methodists, Presbyterians, Congregationalists, Roman Catholics and Baptists – including the German-speaking Lutherans. Their congregants lived in segregated neighbourhoods, worshipped as a rule only among themselves as “Whites” and “non-Whites” respectively. They could at some stage be described as “Churches … who are in communion with a ‘mother’ Church [overseas], and some of whose clergy come from [overseas] … [and] are [not always] unhappy about the apartheid policy.” (Pro Veritate 1.7, Johannesburg 1962, 1). “Like its member-churches … the [Christian Council of Southern Africa] remained a white initiative, unconsciously patronising in its approach to blacks, radiating goodwill but still hopeful of engineering social change through moral appeals, education and the conversion of white South Africans”. (Walshe, Peter: Church versus State in South Africa. The Case of the Christian Institute. London 1983, 58; italics: B.K.-S.) “… [W]hites spoke over the heads of blacks to other whites in trying to find a formula for reform”. (Karis, Thomas G. and Gail M. Gerhart: From Protest to Challenge. A Documentary History of African Politics in South Africa, 1882-1990. Nadir and Resurgence, 1964-1979, Volume 5, Auckland Park, 2013, 80). As far as the Roman Catholic Church in South Africa is concerned, one incidence remains remarkably instructive: In their “Black Priests’ Manifesto” on 23 January 1970, sub-titled “OUR CHURCH HAS LET US DOWN”, the Catholic priest Smangaliso Mkhatshwa and three others contend – exclaiming “ENOUGH! ENOUGH” -, that “[t]he Catholics pretend to condemn apartheid. And yet, in practice, they cherish it”. The priests recall: “The [Catholic] Church practised segregation in her seminaries, convents, hospitals, schools, monasteries, associations and churches long before the [apartheid-regime] legislated against social integration”. Admonishing “the Hierarchy” of that Church for not taking a clear stand against apartheid, they call for change, pointing out with prophetic clarity of vision that “things will change dramatically” eventually. (Mkhatshwa, P.M., Moetapele, D., Louwfant, J.L., Mokoka, C. and A. Mabona: Black Priests’ Manifesto, 23 January 1970, in: Karis and Gerhart, Protest, 435-438). The “English-speaking” churches were “enmeshed in colonial patterns of thought and organization carried over from their missionary origins and constantly reinforced by the dominant racist norms [of the apartheid society]”. (Karis and Gerhart, Protest, 77; Villa-Vicencio, Charles: Eine allgegenwärtige Häresie: Rassismus und die “englischsprachigen Kirchen”, in: Bekenntnis und Widerstand. Kirchen Südafrikas im Konflikt mit dem Staat. Dokumente zur Untersuchung des Südafrikanischen Kirchenrats durch die Eloff-Kommission, Evangelisches Missionswerk im Bereich der Bundesrepublik Deutschland und Berlin West e.V. (EMW) (ed. ), Hamburg 1983, 537-553). Die Christelike Instituut, in: Naudé, Beyers: My Land van Hoop. Die Lewe van Beyers Naudé. Johannesburg 1995, 73-82. “The Christian Institute is based upon the Word of God, upon belief in God the Father, in Jesus Christ the Son, Redeemer and Lord, and in the Holy Spirit, and upon the conviction that for all who share such a common loyalty, it is desirable and necessary that determined effort be made to express and foster their unity in Christ”. (Annonieme Versameling in Verband met Beyers Naudé, die Christelike Instituut en aanverwante Dokumente, Saamgestel deur Murray Coetzee, Beyers Naudé Sentrum vir Publieke Teologie, Stellenbosch Universiteit 2012, A.3.4.6). The Afrikaans-speaking white Dutch Reformed Churches (DRCs) comprised of the Nederduitse Gereformeerde Kerk (NGK), the Gereformeerde Kerk (GK) and the Nederduitsch Hervormde Kerk (NHK), the NGK being generally known also as the “mother-” in relation to the three “daughter- churches” for “non-white” (“Bantu”, “Coloured” and “Indian”) converts and their descendants. (See also: Horrell: Religious Faiths, 4; Meiring: Kerkelike statistiek 177-178). “The Sharpeville shootings of 1960, coinciding with an increase in the African membership of the United Nations, brought the conduct of [the apartheid-regime] to the attention of the Security Council [of the United Nations Organisation], which passed a resolution (S/4300), … stating that the [apartheid-policies] had ‘led to international friction and, if continued, might endanger international peace and security’. … This resolution requested all states ‘to consider taking such separate and collective action as is open to them, in conformity with the Charter of the United Nations, to bring about the abandonment of [the apartheid] policies’. This was the first occasion on which the General Assembly had given approval to a resolution asking for action against [South Africa’s apartheid-regime]”. (Spence: South Africa 513). With regard to the Cottesloe-Consultation, Peter Walshe observes: “Although the Consultation was ecumenical and ‘multi-racial’, it was essentially a white affair – at its core, a group of anguished white clerics setting out to listen to each other and to pay polite attention to the small minority of their black colleagues.” (Walshe, Peter: Church, 11). Karis and Gerhart remark: Even in the Cottesloe-Consultation itself “[W]hites spoke over the heads of blacks to other whites in trying to find a formula for reform.” (Karis and Gerhart, Protest, 80). World Council of Churches, Mission in South Africa April–December 1960, 30–32; Hewson, L. A. (ed. ), Cottesloe consultation: the Report of the Consultation among South African Member-churches of the World Council of Churches, Johannesburg 1961, 74-75. Vicencio, Charles: The Ghost of Cottesloe … A Soweto theological postscript, in: South African Outlook, Johannesburg 1976, 108-109. Naudé sets out repeatedly to spell out and to elaborate on the theological insights and implications of that strife and desire to become ‘a Confessing Church’, stimulating discussions and debates in pastoral convents, congregations and in the general public and, by so doing, introducing a new frame of reference for individual and collective options against apartheid in the mid-1960s and later. (Naudé: Die Tyd Vir ‘n `Belydende Kerk´ is Daar [The Time Is Now for a `Confessing Church´], in: Pro Veritate, 15 July 1965 (Vol 4, Issue 3), 1ff. ; Naudé: Nogeens die `Belydende Kerk´ [Once more: the `Confessing Church´], in: Pro Veritate, 15 November 1965 (Vol 4, Issue 6), 1ff., Naudé: Nou juis die `Belydende Kerk [Exactly now the `Confessing Church´]”, in: Pro Veritate, 15 December 1965 (Vol 4, Issue 8), 1ff). Desmond Tutu, Open Letter to Prime Minister John Vorster, 8 May 1976; Allan Boesak, Open Letter to the Minister of Justice Alwyn Schlebusch, 27 August 1979. (In: Adler, Elisabeth (ed. ): Apartheid als Herausforderung für Südafrikas Christen und Kirchen. Wie Lange Noch? Dokumente 1970 bis 1980, Berlin: Union Verlag 1982, 182-189, 189-194). Ironically, black consciousness and black theology fuelled renewed protests against apartheid just as black youth were in growing numbers abandoning churches for being irrelevant (De Gruchy, 175). Mayathula, V.M. : African Independent Churches Contribution to a Relevant Theology, in Becken, Hans-Jürgen: Relevant Theology for Africa. Report on a Consultation of the Missiological Institute at Lutheran Theological College, Maphumulo, Natal, 12-21, 1972, 174-177). Manas Buthelezi served from June 1973 as the Director of the Natal region of the CI operating from Pietermaritzburg, was banned for five years under the Suppression of Communism Act in December of the same year – hardly six months after his appointment –, remained, notwithstanding, an acknowledged voice in the Struggle and gained more credibility as community-spokesperson and more affirmation as theologian through his renewed commitment after his banning-order had been lifted unexpectedly before expiry-date. Oshadi Phakathi had joined the CI in 1973, attended as observer the All African Conference of Churches (AACC) in Lusaka in May 1974, became part of a movement within the member-churches of the SACC which, in August 1974, tabled the Hammanskraal Resolution on conscientious objection. Oshadi Phakathi initiated and co-ordinated an array of grass-roots’ projects involving women and men in rural areas on issues ranging from attempts to sensitise and motivate pastors and teachers to participate in community-initiatives for rights, women’s call for the release of political detainees, adult-education and empowerment in the face of forced removals, discussions and debates on current issues based on black consciousness and the quest for commitment for justice as Christians. Some of the themes she talked on, were: ‘How do we change the present church system to the church of Christ?’, ‘Black Theology’, ‘A black view of the emancipation of women’, ‘What people expect from priests’ and ‘The challenges facing Christian women today.’ (Walshe, 161-165). Mkhatshwa et al (eds. ): Black Priests’ Manifesto, in: Karis and Gerhart, Protest, 435-438. Page 1 of the very first issue of Pro Veritate on 15 May 1962 opens with an instructive contribution by a renowned NGK-theologian, P.G. Geertsma, entitled “’Apartheid’ van die Gelowiges volgens ons Belydenisskrifte” [‘Apartheid’ by Believers based on the Creeds of our Faith], contending that Scripture stands for “apartheid”, albeit of a particular nature , the “’apartheid’ that God constitutes through Christ” – a contention that was not challenged or questioned in any way by any of the editors of that publication-organ purporting to be committed to the Truth, Pro Veritate! Merely a few readers, among them S. du Toit [Potchefstroom] and Ben Marais [Stellenbosch], responded, arguing critically in the subsequent editions. The edition of November 1976 of Pro Veritate was confiscated before publication in the raid on Diakonia House. The article entitled “Time has run out” by the Ministers’ Fraternal of Langa, Gugulethu and Nyanga, on page 12 of the February 1977 edition, was banned. The following editions contained material which was subsequently banned: the September 1972 edition (quotations from “The Eye of the Needle” by Rick Turner), the January 1973 edition (quotations from “Black Viewpoint” article by Bennie Khoapa), the August 1975 edition (banned Posters on cover), the September 1975 edition (banned Posters on cover), the November 1976 was confiscated, the February 1977 edition (article: “Time has run out”) was banned. Meyer, Roelf and Beyers Naudé: Christusfees of Baalfees? `n Ope Vraag aan Suid-Afrika oor Geloftedag, Supplement to: Pro Veritate, 15 December 1971. These included My Decision (Johannesburg 1963), which comprises three short sermons by Beyers Naudé, one of which is based on the Bible-verse out of the Book of The Acts of the Apostles, chapter 5, verse 29, [… obey God rather than humans], substantiating his decision to abandon pro-apartheid networks and embark onto searching for truth and togetherness beyond apartheid; an address entitled, Apartheid Morally Unacceptable; a booklet, Divine or Civil Obedience; a courageous statement entitled, The Christian Institute’s Viewpoint on White Immigration to South Africa (Johannesburg 1974), in which a call for an immediate cease of white-immigration to South Africa is made; a similar call by the Institute on overseas investors to stop investing in the apartheid-state was made on 22 October 1976 following the resolution adopted by the Annual General Meeting in Edendale on 18 September 1976; study-guide material for congregations and institutions including Poverty in Abundance or Abundance in Poverty by Rolf Meyer (Johannesburg 1973) and The Message of Liberation Today by Johannes Verkuyl (Johannesburg 1971). Christian Institute of Southern Africa: ‘Director’s Report for the period 1st August 1971 – 31st July 1972’, Johannesburg, p. 4, typescript. I contend: Albert Luthuli, the author of “Let My People Go!” (1962), held in high esteem especially for have been “bound by faith” in his commitment to non-violence (Scott Couper 2010) and Beyers Naudé, the preacher on “obeying God more than humans!” (1963) – both outspoken and renowned opponents of apartheid and Protestant-preachers with a prophetic-critical voice, the one Congregational, the other Reformed, the one a beacon in the Struggle and head of the ANC, the other an accredited coordinator of a constructively progressive move among theologians of the (white) DRCs and a disputed but acknowledged personality in the Afrikaans-speaking white community – could most probably have promoted the then fledging inner-Southern African ecumenical and civil rights’ movement remarkably, had they ever ‘discovered’ each other and found means of working together. Meiring: Stemme, 1975, 1-21, 22-33, 34-43; Annonieme-Versameling, A.3.4.6. South African Council of Churches: A Message to the People of South Africa, Johannesburg 1968; SA Rad van Kerke: “Message to the people of South Africa”. ‘n Boodskap aan die volk van Suid-Afrika, in: Annonieme-Versameling, A.3.24.1. ; Walshe describes the “Message” as “the first systematically formulated Biblical and theological statement on apartheid since Cottesloe and the Roman Catholic pastorals”. He resumes: “… As a result every Christian in South Africa had to face the question: ‘to whom, or to what are you truly giving your first loyalty, your primary commitment? Is it to a subsection of mankind, an ethnic group, a human tradition, a political idea, or to Christ?’” (Walshe, 60 and 61). “[T]he Message did delineate the social challenge to Christians at the basic level of Gospel insights, so disseminating more widely what had been the Christian Institute’s position. In Naudé’s terms [the “Message”] ‘clearly and unequivocally refuted apartheid [from] a biblical standpoint’. (Naudé, C.F. Beyers: ‘Apartheid is in Stryd met God’, Ster, 13 November 1970; Walshe 62). “[T]he Message … helped to raise political consciousness among a small minority of whites and many blacks who later were able to develop its insights much further during the turmoil of the 1970s”. ( Walshe, 62). One of the first inner-Southern African responses to the WCC-resolution was given by Peter Randall, co-ordinator of the Study Project on Race in Apartheid Society (SPROCAS) that had been launched jointly by the CI and the SACC in 1969. His statement was in every respect characteristic of the self-esteem and the level of political consciousness among most activists within the CI and the SACC and in the “English-speaking” sector of the white community in the early 1970s: Support for the liberation movements – so Randall – implied that the WCC wanted ‘to see these organisations [ANC, PAC and SWAPO] succeed in their aim of taking over control of the white-led countries of Southern Africa’. Randal wondered, however, if the WCC had considered the kind of society that those organisations would like to see emerging in the region, for – he contended – the aftermath of a guerrilla-war did ‘not augur well’. ‘Had the WCC leaders exhausted every other approach’, he asked, ‘before giving tacit approval to violence’? He hoped the WCC had considered these matters because ‘even those whom the WCC would, by implication, like to see killed [sic! ], have a call on the compassion of their fellow-Christians. Or have white South African Christians finally been written off as beyond redemption?’ (Pro Veritate, September 1970, pp. 15-16; Walshe, Church, 115; italics: B.K.-S.). The Schlebusch/Le Grange Commission was “not a judicial commission but a group of partisan white politicians who sat in camera, withheld the names of witnesses, denied defendants the right to cross-examine their accusers, and did not publish evidence.” (Walshe. Church 174) “However, the main issue was not simply the prejudiced nature of the Schlebusch-Le Grange Commission, its secrecy and failure to observe judicial procedures; it became a matter of ‘Divine or Civil Obedience’, the right and duty of churches ‘to resist un-Christian governmental authority in the name of Christ’. Citizens did not owe ‘blind obedience und servile submission’ to the state. (Walshe. Church 174-175; Italics: B.K.-S.) (See also: Die Verhandlung, in: Weßler, Rudolf (ed. ): Südafrikas Christen vor Gericht. Der Fall Beyers Naudé und das Christliche Institut. Wuppertal 1977, 56-167; Kommissie van ondersoek na sekere organisasies (CI en ander) onder voorsitterskap van onderskeidelik JT Kruger, AL Schlebusch en L le Grange (4 Julie 1972 – Desember 1973), in: Annonieme-Versameling, Vol IX, A.3.22.1). “For a brief period the Institute had been prepared to support investment in the Bantustans, but not in the ‘central economy’ … In March 1976 Naudé issued a joint statement … with Chief Gatsha Buthelezi … (calling) for a national convention with full black representation … the purpose of the convention being to discuss the country’s future and such issues as foreign investment”. (Walshe, Church, 197, footnote 83; Inligtingstuk oor: “Foreign investment in SA” deur G Buthelezi en B Naudé, 10 Maart 1976, in: Annonieme-Versameling, X. A.3.14.16; CI se reaksie tot die “Investment Debate”, September 1977, in: Annonieme-Versameling, X. A.3.14.28). Frank Chikane, who became SACC general secretary in 1987, acknowledged the 1974 resolution on conscientious objection retrospectively (in 1992) as “the most decisive moment in the history of the SACC’s effort to define its theological and political position on apartheid”. (Chikane, Frank: A Critical Examination of the Theology and Praxis of the SCC, 1968-1988, M.A. thesis, University of Natal, Pietermaritzburg, 1992, in: Karis and Gerhart (eds. ), Protest, 5, 89, footnote 89; Conscription and resistance to conscription – a brief history, Alan Paton Centre & Struggle Archives, Pietermaritzburg, P9/1/1/1, 1). The step to withdraw their membership in the WCC in response to the Cottesloe-Declaration was symptomatic of the perception they had of themselves at the latest in the early 1960s with regard to apartheid and those questioning its policies and practice. It may, however, not go unnoticed that “the cautious and socially conservative [English-speaking] Presbyterian Church of South Africa was badly divided in voting 75-75 to maintain its membership of the WCC”. (Walshe, Church, 114). “While [the Presbyterian Church] then passed a resolution dissenting from the ‘violence pursued by guerrilla organisations’ and from the WCC-grants to them, the Church nevertheless went on to ‘dissent at least as much from the violence inherent in the racial policies of the Government’. (Pro Veritate, October 1970, 7). The assertion and the expression of the desire and the resolution “to go it alone”, which was cherished within the fledging Black Consciousness Movement, can be understood in the same sense as the argument that Rick Turner, outspoken activist against apartheid, later tried to drive home to counter assumptions and charges of “white supremacy” made by the BCM against “white liberals” in the early 1970s: “For the proponents of black consciousness the best way to convince black people that salvation will not come from “white liberals” is by simply getting on with the work of community organisation”. (Document 28. “Black Consciousness and White Liberals.” Article by Richard Turner, Reality, July 1972, in: Karis and Gerhart, Protest, 443, italics: B.K.-S.). [BK1] They were „enmeshed in colonial patterns of thought and organization carried over from their missionary origins and constantly reinforced by the dominant racist norms [of the apartheid society]”. (Thomas G. Karis and Gail M. Gerhart, From Protest to Challenge. A Documentary History of African Politics in South Africa, 1882-1990. Volume 5. Nadir and Resurgence, 1964-1979. Auckland Park. ISBN 978-1-77009-884-8. (77).